A new roundabout built in 2015 will have to be ripped up and replaced nearby as part of the £23m Newhaven Port Access Road works, according to campaigners. Community Action Newhaven (CAN) has argued East Sussex County Council is wasting money, but the authority has pointed out that the original works were fully funded by a developer hoping the four-arm roundabout would serve a supermarket. But with no prospect of the supermarket now being built the council says the existing junction will be replaced by a three-arm design as per the planning permission given for the Newhaven Port Access Road. Emily O’Brien, spokesperson for CAN, described ripping out a brand new roundabout and rebuilding it just a few metres away as a ‘scandalous waste of money’. She said: “Surely the time has come for East Sussex County Council to admit their £23 million white elephant is out of step with their dire financial situation. Campaigners have argued the new road will destroy a wildlife site and add to Newhaven’s existing traffic problems instead of helping them and rather than acting as a new ferry terminal would mainly benefit a handful of private companies. But a county council spokesman said: “This road will have huge benefits both in improving access for the many existing businesses and residences in the area and in opening up land already allocated for employment use to attract new businesses to the area. The Department for Transport has contributed £10m for the scheme, with the remaining £13.2m funded from the council’s own capital programme, which is for one-off projects only and cannot be used for day-to-day services. 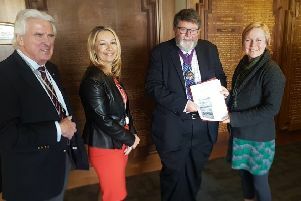 The county council spokesman added: “Plans for the Newhaven Port Access Road have not changed from those given planning consent, which are publicly available on the county council’s website, and have always included a three-arm roundabout. “The first phase of the road was constructed by a developer at no cost to the taxpayer. This included a four-arm roundabout which the developer hoped would serve a supermarket to be developed next to the road. This roundabout had planning permission from Lewes District Council. Now with no prospect of the supermarket being built on the site, the four-arm roundabout - fully funded and built by the developer - will be replaced by the three-arm design as per the planning permission granted for the Newhaven Port Access Road. Details of the port access road are available on the county council’s website. Community Action Newhaven has a Facebook page which can be found here.